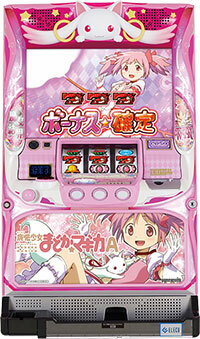 Today, we will be introducing a third pachislot machine of a popular content “Puella Magi Madoka Magica”. This new machine is quite simple and clear, that it is a “normal type” in which player gains the winnings just by the bonus!! This machine is loaded with renditions that suggest the percentage of a winning. If a special rendition such as “Kyubey Challenge” occurs, player can highly expect a jackpot!! During a bonus round, player gets to choose if they want to listen to the soundtracks, including the latest number called “Stairs”, or they can choose to watch one of the 45 famous scenes from the anime!! This new machine is created so well that fans of the original work and fans of the pachislot machine can both agree this is the ultimate “Madoka Magica” pachislot machine!! Give it a try when you find it.